Successful travel writing requires a lot of creativity. Dreaming up salable story ideas and selling those ideas to an editor is very difficult if you’re just getting started. 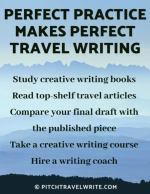 Earlier this year I started coaching some aspiring travel writers. I’m thoroughly enjoying the process of giving advice, and steering them to success. It’s fun watching enthusiastic beginners get all fired up when their stories are published. It reminds me of how excited I was when my first stories were accepted for publication, and then a few months later when the stories appeared in print. In my coaching program our first goal is to approach print magazines. Generally, print magazines pay their writers while most online sites don’t pay. And print media still comes with a hefty dose of credibility, more so than with online media. New writers have the same areas for improvement - shortcomings clearly due to lack of experience. Once you learn what to do to succeed, all that’s left is doing it. 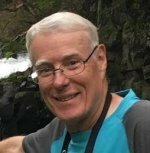 My ‘stable’ of writers has already had a number of notable print successes with stories accepted for Canoe & Kayak Magazine, Renaissance Magazine, Discover Britain, New Dawn, Overland Journey, 4 x 4, Northwest Travel, and several other print magazines. In a very short time these new writers produced amazing results! 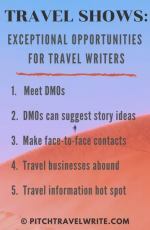 When it comes to creating a list of potential story topics, many beginners think the tourist agency media rep provides you with your story ideas. This isn’t the way it works. 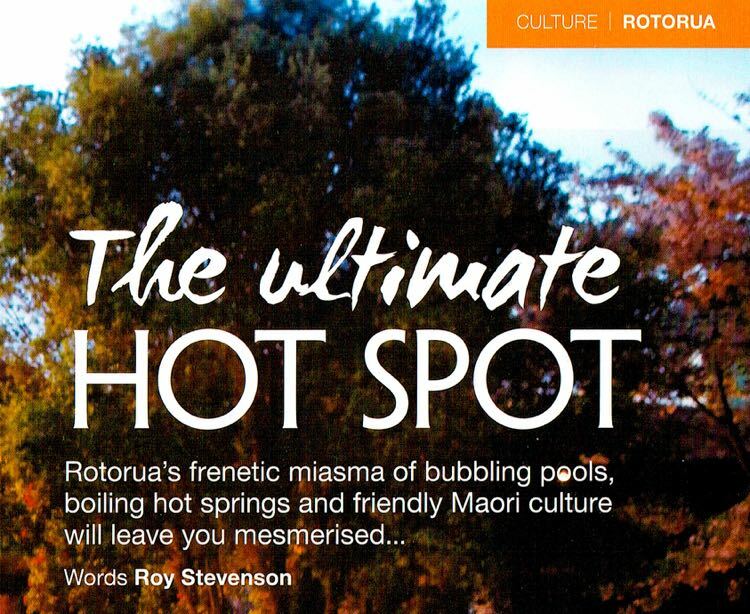 Successful travel writing means it’s the travel writer’s job to thoroughly investigate a destination and hunt down the interesting attractions that might make good travel stories. I get dozens of monthly roundup emails from CVB and tourist agency media reps telling me what’s going on in their destination, complete with suggested story ideas. While I never discount their ‘canned’ story ideas, I prefer to come up with my own. The media people do their jobs by informing you about what’s new and what’s hot. I occasionally use their suggestions for my stories. But what’s more common is to take one of their suggested story ideas and tweak it to fit my outlets. Many beginning writers think that a story title (“Renaissance Canterbury”, “Mysterious Glastonbury”, “Beer Drinking in Belgium”) is a pitch. The above are all working titles for my story ideas that eventually were published. Notice, they are all vague concepts and desperately in need developing. I researched these topics and dug up a whole lot of juicy facts before I pitched any of these stories. A story title is simply the beginning of a process. Once you add your research, it either helps you to reinforce the story idea or helps you make the decision to discard it. Successful travel writing tip: It’s important to always research the “who, what, where, when and why” of a potential story to help you decide whether it’s marketable or not. When my writers send me a story title, the first thing I do is request a file of information about the destination. They prepare their research and send it back to me. Then, I take a look through their information and see if it needs further development, or if it’s ready to be converted into a query letter. Story ideas often start out sounding weak, but with some development they can turn into something excellent. 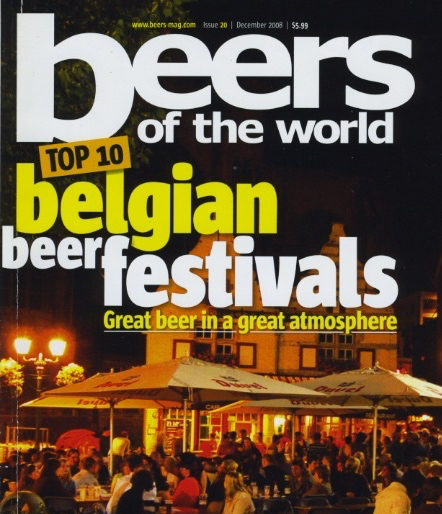 "Beer drinking in Belgium" turned into "The Top 10 Belgian Beer Festivals" after some research and a little creativity. I often wonder how many story ideas lie in the ‘dead story’ graveyard simply because they weren’t developed enough. Take the time to develop your story idea before you send out your query letters. This is related to the previous point. If you don’t uncover enough details and juicy facts about a destination or attraction, you’re likely to submit a half-baked, underdeveloped query letter that has “beginner” written all over it. I always ask my writers to insert more information into their query letters before they send them off. There’s a myth circulating that query letters should be kept short. This is okay to a point, but you are also obliged to give the editor enough detail to show him or her that you know enough about your topic to write a good story about it. Sending scant details in a query letter is far more likely to get your query email deleted than sending too much information. It also saves the editor the extra effort of requesting more details from you, if they like your story concept. 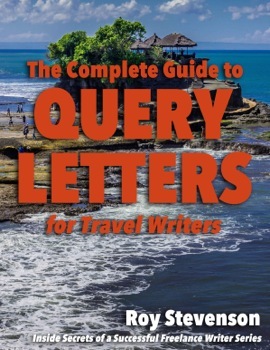 If you look through some of the query letters in my eBook, The Complete Guide to Query Letters for Travel Writers, you’ll find several of my query letters that seem to be unusually long (they range from 1.5 to 3 pages). Yet my stories were published in some excellent, glossy, top shelf magazines as a result. Beginning writers have a tendency to sit back after sending out a query letter to a magazine editor, and then wait for things to happen. Successful travel writing tip: My advice is to keep pumping out queries continuously. Don’t stop! There have been times when I’ve sent out query emails en masse to magazines every morning for several straight weeks. And I usually send out at least one query every day. You need to continually feed the query machine. It’s what provides you with plenty of travel stories to write. Queries are your lifeblood. When you approach the Convention & Visitors Bureau (CVB) media reps with a handful of assignments, they are more likely to come up with support for your trip (comped hotels, restaurant meals, entry to tourist attractions, ground transport, and personal guide). Successful Travel Writing Tip: The best approach is to dream up several story ideas from your own research and then find outlets for them. Do this before you take the trip. 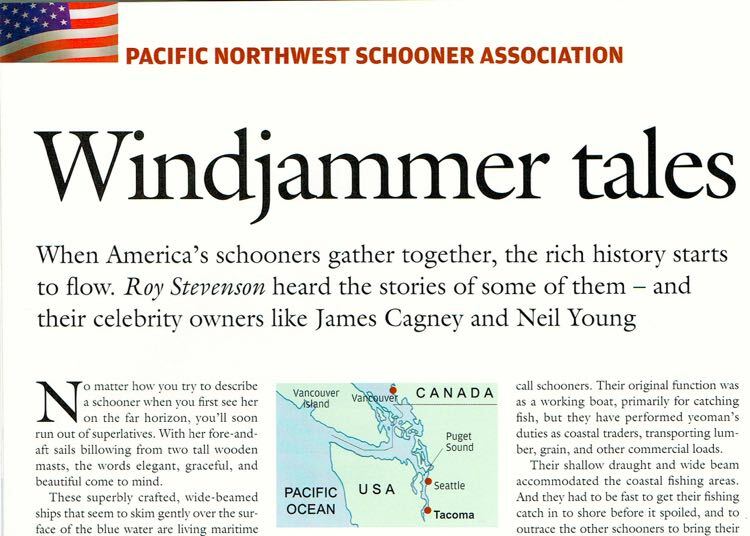 Having several assignments will often make up for a beginning writer’s lack of bylines. If you have a few assignments (also know as Letters Of Assignment, or LOA’s) the CVB media reps don’t care if you’re a beginner. But they’re less likely to comp you when you don’t have any LOA’s. Only the most well-known travel writers walk into a destination without any assignments, expecting everything to be laid on. Even with my plethora of published articles (over 900) published in more than 190 different magazines and other print and online media, I seldom get a free ride without an LOA. In other words, I’m usually asked to provide proof of assignments before the tourism agency reps lay out the red carpet for me. Your assignments are your collateral to exchange for complimentary travel assistance. I often wonder how many queries are rejected for the reasons outlined above. There must be thousands of them. You could lump all of these travel writing tips under ‘being proactive’. Spend time doing these things so you don’t submit half-baked story ideas to editors, and then wonder why your stories aren’t picked up. For successful travel writing, be proactive. Follow the tips in this article to succeed in selling your stories.